Hundreds have been detained in Russia including the protest organizer Alexei Navalny “during unsanctioned” opposition protests across the country demanding the resignation of Russian Prime Minister Dmitry Medvedev for corruption allegations. The protest spanned all across the Russian state and is estimated to have amassed 8,000 people in at least 100 cities according to organizers. There was no immediate number of known arrests. Russian human rights group OVD-Info tweeted that more than 700 had been detained, but the Russian state-run news agency Ria Novosti contradicted that claim, stating that 500 had been arrested. The demonstrations were organized by Putin critic Alexei Navalny, after his Foundation for Fighting Corruption released a report contending that Prime Minister Medvedev has amassed a fortune through corruption including a collection of mansions, yachts, and vineyards. Medvedev’s spokeswoman Natalya Timakova told state-run news agency RIA Novosti, “It is pointless to comment on the propagandistic outbursts of a convicted opposition figure, who has already announced he is running some kind of election campaign and fighting against the authorities.” Kremlin spokesman Dmitry Peskov called the report “not the first creative effort from this well-known convicted citizen,” according to Tass. 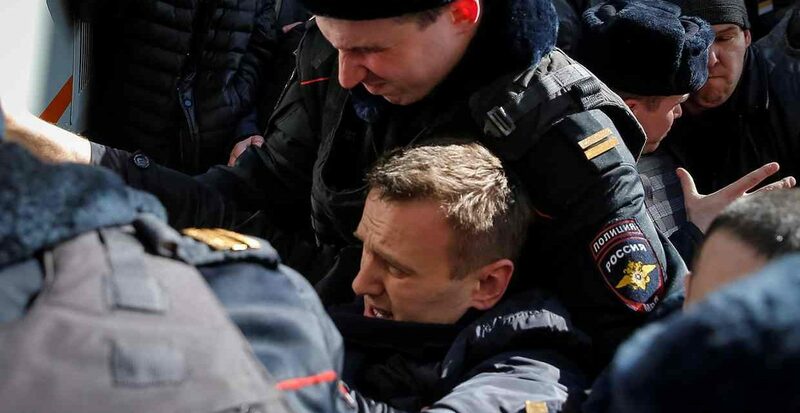 Navalny was among those arrested along with 500 others in the central city according to Russian state news agency Tass which cited a Moscow police statement. RT caught the moment that Navalny was arrested. He downplayed his detention in a series of tweets and encouraged protesters to keep marching against Kremlin corruption. “Today we are discussing and condemning corruption, not the detentions. Well, I was detained. So what. It ok. There are things in life that are worth being detained for,” Navalny tweeted. In other cities – Perm, Ufa, Vladimir, Voronezh, Barnaul, and Krasnoyarsk, hundreds took to the streets in rallies sanctioned by the authorities RT reported. The protest remained largely peaceful but drew heavy police presence when Navalny was arrested surrounding the bus with the protest leader inside. Police released those detained after they were identified shortly after. Only one person was hurt thus far, being a policeman that was seen lying on the ground, and one serious arrest of an armed man who was carrying a pistol.